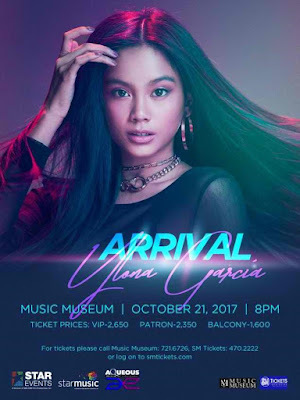 Ylona Garcia, MOR Pinoy Music Awards’ recently hailed Female Artist of the Year, is ready to make her mark in the Philippine concert scene with her very first solo major concert, “Arrival: Ylona Garcia,” on October 21 (Saturday) at the Music Museum. The Filipino-Australian singer, who also won MOR’s “LSS Hit of the Year” award for the “O Pag-ibig” song collaboration with Bailey May, is all set to showcase her exceptional vocals for an exciting concert produced by Star Events and Aqueous Entertainment. The 15-year old singer and songwriter rose to fame in 2015 because of her bubbly personality and great singing voice which viewers loved in ABS-CBN’s hit reality program Pinoy Big Brother 737, and she successfully went on to become the show’s 2nd teen big placer. Now, the Kapamilya teen star is expected to bring the house down in this much-awaited musical production that follows the success of her first digital One Music PH concert held last year. She is slated to perform cuts from her “My Name is Ylona Garcia” debut album released in 2016 under Star Music, as well as surprise performances that will uncover the ASAP BFF5 member’s versatility in music. Alexa Ilacad, Krissha Viaje, Inigo Pascual, Bryan Chong, Janah Zaplan, and other surprise guests will be joining Ylona for this momentous evening. Tickets to “Arrival: Ylona Garcia” are priced at P2,650 (VIP), P2,350 (patron), and P1,600 (balcony). For inquiries, call Music Museum at 721.6726, SM Tickets at 470.2222 or log on to smtickets.com. For more information, visit Starmusic.ph or follow Star Music’s official social media accounts at Facebook.com/starmusicph, or @starmusicph on Twitter and Instagram.